Ready for some peace and quiet? Looking to get outside this holiday weekend? Summer has arrived and there's no shortage of options when it comes to open trails, campgrounds and other activities in the Wood River Valley. Bald Mountain is a popular destination for winter recreationists, but Sun Valley Resort offers options for summer visitors as well. The Roundhouse gondola and the Christmas chairlift will both be open for the holiday weekend. Lift tickets are $25 per one-way use for adults, and an all-day pass is $30. The lifts are open from 9 a.m. until 4:30 p.m., and the gondola also brings diners to the Roundhouse restaurant midway up Bald Mountain for dinner. 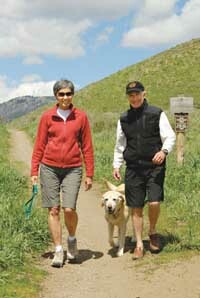 Baldy is crisscrossed with 28 miles of hiking and biking trails. Perhaps the most popular is the Bald Mountain Trail, a five-mile hike that climbs more than 3,000 vertical feet to the mountain's peak. Hikers can make the climb and ride the Christmas chair and gondola down, or ride the lifts up to the lookout and take the easier downhill trail. The trail is one-way uphill for mountain bikers, but other trails off the top provide an exciting ride down. Bikers may want to take advantage of new trails in the area, including the one-mile Forbidden Fruit flow trail off Eve's Gulch just north of Ketchum. This is a mountain-bike-only, one-way downhill trail that can be found about 3.5 miles from the Adams Gulch trailhead. Mountain bikers can also check out the new Punchline Trail off the Croy Canyon system, a technical one-mile trail that features rock obstacles and about 40 turns. One benefit to a cold, damp spring is that wildflowers should be in full bloom for the holiday, said Renee Catherin, trails and recreation director for the Ketchum Ranger District. "The weekend of the Fourth of July [will be] perfect for wildflower enthusiasts," she said. Catherin recommended the Adams Gulch system north of Ketchum for lupine seekers, but said Greenhorn Gulch has many beautiful hikes that see less traffic. The Fox Creek trail north of Adams Gulch and the Corral Creek trail off Trail Creek Road, east of Sun Valley, are also open. Catherin recommends both for shady, moderately easy hiking. The Pioneer Cabin trail will still have snowy patches, and Baker Lake and Norton Lake are likely to have high water at stream crossings, Catherin said. The Forest Service plans to build bridges at the crossings this summer, but not in time for the holiday. Trails around Galena Lodge are beginning to open up as well, said Don Shepler, concessionaire at the lodge. "It's awesome, because everything is so green right now and the flowers are starting to pop," he said. "It's stunning." Shepler recommended the Yurt Loop, a 1.8-mile trail that leaves from the lodge. The loop connects to the Psycho Trail, a 3.1-mile loop that takes hikers along a scenic ridge near Senate Creek. For those looking forward to camping over the weekend, Shepler recommends Senate Meadows near the lodge. All the campgrounds in the Sawtooth National Recreation Area are open with full services, including water, trash, bathrooms, camp managers and fees. Campground reservations can be made by calling the National Recreation Reservation System, 877-444-6777 or online at www.recreation.gov. Not all campgrounds can be reserved, however. The Stanley area and the rest of the Sawtooth Valley is starting to open up as well, said Ellen Libertine, coordinator for the Stanley Chamber of Commerce. "Almost all of our trails are open now," she said. Boundary Creek, Stanley Creek, Elk Mountain Road and the Fourth of July Creek trails are open and clear for the holiday weekend, but Libertine said she likes to recommend the Redfish Lake Trail, especially for those from out of town. "You can go up far enough so that you're looking down at the lake," she said. "It's such a beautiful view." The Redfish Visitor Center will be open for the Fourth from 10 a.m. to 5 p.m. The center provides information on area outdoor recreation, but those looking for more information can also call the Sawtooth National Recreation Area at 727-5000 or the Ketchum Ranger Station at 622-5371.